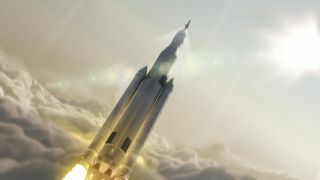 NASA’s Space Launch System will represent the most powerful rocket ever built for deep space missions. Image released August 27, 2014. It's possible that the Space Launch System rocket test flight could launch as early as December 2017, but NASA officials have committed to having the rocket ready for flight be the end of 2018 to be safe. That extra wiggle room should let the space agency cope with scheduling and funding issues as they crop up in the future, NASA officials said in a teleconference with reporters. "Our nation is embarked on an ambitious space exploration program, and we owe it to the American taxpayers to get it right," NASA associate administrator Robert Lightfoot, said in a statement. "After rigorous review, we’re committing today to a funding level and readiness date that will keep us on track to sending humans to Mars in the 2030s – and we’re going to stand behind that commitment." As seen in this artist's illustration, SLS will represent the most powerful rocket in history. Image released Aug. 27, 2014. "They're [the review board] telling us that if we don't do anything, we basically have a 70 percent chance of getting to that date," William Gerstenmaier, NASA's associate administrator for the Human Explorations and Operations Mission Directorate, said during the news conference. "Our intent and the team's intent at Marshall [Space Flight Center] is to go look at those problems and see what we can do to mitigate those problems." "There are probably some other problems that aren't even identified by the Standing Review Board that will come up," Gerstenmaier added. "Our job as a management team is to look at those problems, figure out ways to work those ahead of time, and proactively work those as they come about." It's possible that the first SLS flight could occur before the 2018 target if the team works to head off any potential issues before they occur, according to Gerstenmaier.